After Hurricane Harvey, my four-year-old, Sammy, was very worried about natural disasters. We didn’t expose him to much information about what happened, but he caught us watching the news every once in a while. For months he asked me a million questions about storm preparedness—he questioned the qualifications of the person who built our house, he worried about where he should go if a hurricane hit Austin, and he grilled me about the structural integrity of my parents’ home in Florida (he loves his Mimi). One day Sammy started to cry as the sky became cloudy while we were on a walk in our neighborhood. He demanded that we go home immediately so that we could “stay safe.” I’ve been told that concern about the weather is a sign of genius in children (obviously true! ), but Sammy’s nervousness was about more than just the meteorological interests of an intelligent child. He was really scared. We did our best to answer his questions and calm him, and, fortunately, he had an excellent teacher who we saw, and spoke with, every morning and who kept a close eye on every child in her class. Lately, the school safety conversations in the Capitol have been about “school hardening” and increasing the presence of police in schools. This includes changes to actual school buildings (metal detectors, limited entrances, etc. ), and proposals that would encourage schools to have more police officers, to hire retired police officers and military veterans to serve as campus security, and to open their campuses up to the regular presence of non-school law enforcement (who would stop by to eat lunch or fill out paperwork). Even if I wasn’t involved in helping children, families and communities day to day, I would be skeptical about the idea of making schools hard—it seems ineffective and terrifying on its face. Why on earth would we harden schools when the world is hard enough already? All children are just trying to navigate their environments, figure out how they fit in, and learn the rules and expectations. Some kids are battling situations and environments that are legitimately tough and scary. School should be a refuge for young people—a place where they know they are a valued member of the community, where they receive the supports they need to learn and thrive, and where they feel connected to adults who care about them and treat them fairly. Those adults should be trained and qualified to understand and address the needs of children in appropriate ways. They should be teachers, counselors, and social workers, not law enforcement. Schools simply shouldn’t be hard, they should be welcoming and affirming. Fortunately I do know something about school safety. 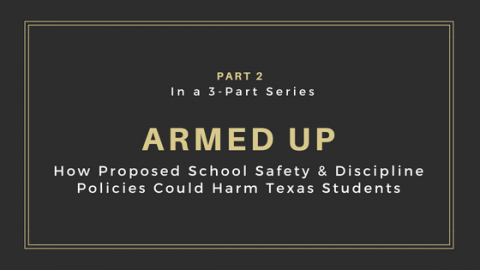 Texas Appleseed has been researching the impact of exclusionary discipline and police in schools for more than a decade, so I am not just skeptical of hardening schools and increasing police presence, I am adamantly opposed to the ideas. Highly visible security measures do not increase feelings of safety in schools and can actually make students feel less connected to their campus communities. When there are more police officers on a campus, they are expected to respond to routine discipline issues (which many officers are not interested in doing), and are not solely focused on real safety threats, which are actually rare in schools. Behaviors that would have been handled by a teacher or administrator in the past are now treated as criminal matters, exposing kids to harmful law enforcement and court interactions and compromising their ability to succeed academically and stay engaged in school. This is particularly true for kids with disabilities, and Black and Latino students, whose behaviors and schools are policed at disproportionately high rates. Additionally, we know from research by the Secret Service and the Department of Education, that the best way to prevent school shootings is to create positive school climates where members of the campus community have strong, trusting relationships. This way, underlying issues can be addressed so that they don’t escalate into violent behavior, and students can feel comfortable telling an adult when they are worried about a peer’s behavior. The recent policies and ideas presented, including more police, are disguised as security measures when, in fact, they create the opposite effect. We cannot implement policies that have no basis in research or evidence and that could actually result in harmful outcomes for kids and less safe schools. Especially when we know that there are other, effective ways to create positive school climates at campuses where qualified adults utilize appropriate strategies to support children. I am advocating for changes that will make a difference. We need actual school safety, not the appearance of school safety. Lawmakers will do us all a disservice if they ignore what creates safe schools and instead gravitate to what’s easy or what they believe to be true. Recently, I listened to testimony at a hearing convened by the Texas Senate Committee for Violence in Schools and School Safety. A school district administrator was describing the drills, security measures, and even coloring books that were given to very young elementary school children in his district to prepare them for an active shooter situation. As he spoke, I thought about Sammy and the fear he would feel (and endless questions he’d have) if he were told that someone may hurt him in school, and if every aspect of the building—metal detectors, police, coloring books—seemed to confirm that violence was imminent. I imagine that would be traumatic for him and for his friends and extremely challenging for his teacher. As we discuss school safety this summer and during the next legislative session, we must embrace and adopt research-proven, good ideas. Anything else creates a false sense of security at a time when real solutions are needed.